Skatewheel Conveyor does come in various configurations, but the operating principle is the same. A number of individual galvanized wheels are spaced accordingly on a round threaded shaft separated by galvanized spacers. The shaft is contained within formed punched frames by retaining nuts. 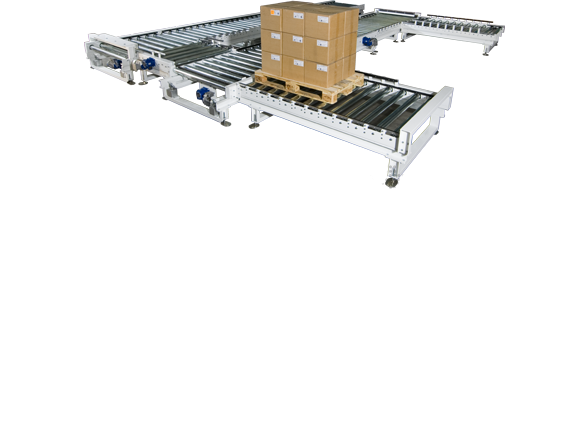 Skatewheel conveyor is suitable for lighter loads that may require a temporary installation. Galvanized construction provides excellent durability for applications such as warehouse and the food delivery industry. Custom or standard legs can be provided in various heights in bolt-on configurations. Many styles of skatehweel conveyor are in stock and available for immediate shipment including; straights, curves, and spurs.